Whenever I think of the word "winner", Serena Williams' name usually comes to mind. Her stats as a tennis player are simply astonishing. So far, she's won 92 out of 113 games. That's an 81% success rate! She's been ranked six times No 1 in the world by Women's Tennis Association, the only female player to have won $60 million in prize money, and she holds the most titles of all active players (male and female). 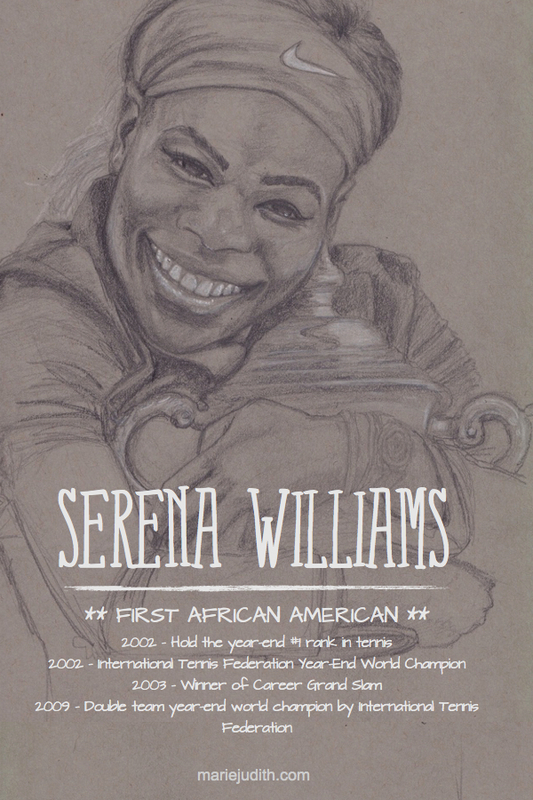 Not only did she break records for African Americans, but for all women in tennis. I remember, watching some tennis matches when I was younger during the Agassi era, and I always thought the games between the women were so boring compared to the games between men. Serena changed that. She definitely elevated the game for women and also made it more interesting with her colourful and original outfits. She essentially broke the previously restrictive mold for female tennis player and allowed them to be themselves on the court. She put her mark in history and is a true legend and inspiration.